I was looking around my yard this spring and thought, "Hey, I think I'll start a garden this year." If you know me, that's a pretty ambitious goal since I have a complete black thumb. I waste more money on buying house plants just to kill them within a few months time. It's rather pathetic, really. Imagine my surprise when not only did my tomato plants live, they thrived, producing tons of tomatoes! Even after giving some away, I still have more than I know what to do with. Of course, I turned to my trusty Golden Blossom Honey recipe page for inspiration, and zeroed in on these Baked Tomatoes. This is such a flavorful and heart healthy side dish! 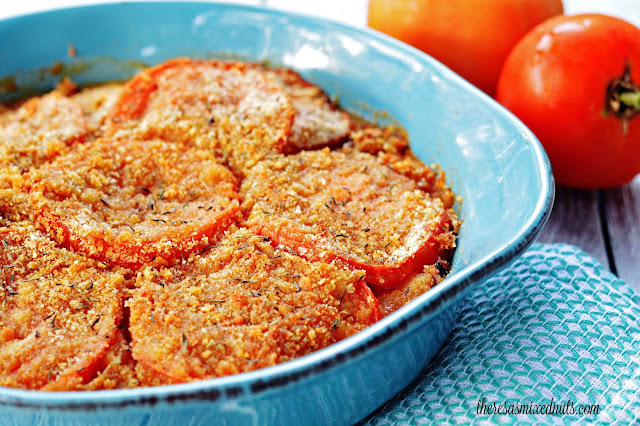 The crispy breadcrumbs add a great contrast to the tender tomatoes. It's just an overall delicious recipe! Did you plant a vegetable garden this year? What's your favorite veggie to grow? But looks nom nom... never heard of baked tomatoes. Non nom and then some. Looks fantastic. I love baking tomatoes. My husband is part Italian so he knows a bunch of fun recipes like these. What a great idea... adding honey to tomatoes. Will have to give it a try soon as we have tomatoes in our garden as well. I make breaded eggplant for my family, but the coating needs a little sone thing. I'd love to try your recipes with both tomatoes and eggplant. I would love to try making this recipe. It looks so delicious. I have never tried baked tomatoes before. Hooray for a successful garden! 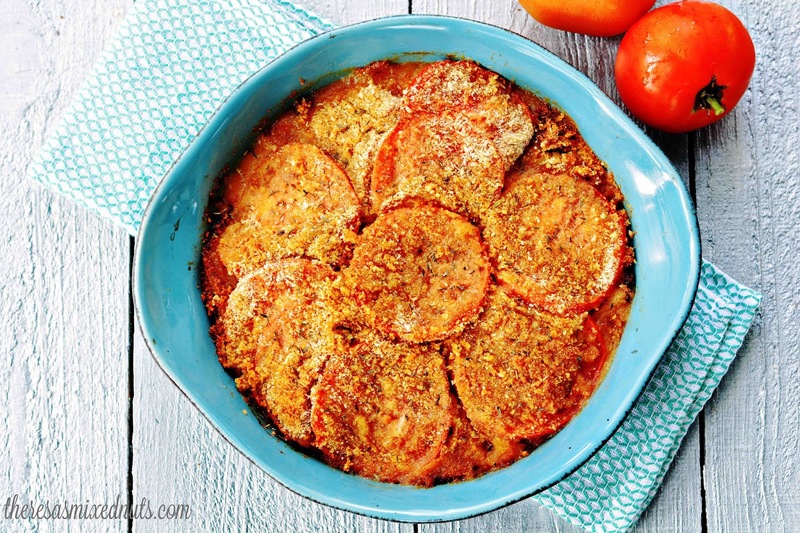 I have never tried baked tomatoes but they look outstanding. I've never had baked tomatoes. This looks delicious! Love homegrown too! These look so good! I'll have to give it a try. Isaak LOVES tomatoes. That is a tasty side dish. We all love tomatoes in our house. Love home grown. This is an awesome recipe. Anything tomatoes is for me. Thanks, Theresa! Oh so yummy! I missed not being able to do a garden this year. We thought we would be all moved out by now. But, thats ok. We are surrounded by farmers that have some of the best garden treats. We grew a few things. It was hard this year with all that rain. We grew peas, green beans, corn (which didn't do well), and strawberries that can't be eaten until next year. Looks delicious! We usually have a veggie garden, but not this year. We moved at exactly the wrong time. I am totally making this today!!! I have so many tomatoes ripening so I must thank you for this recipe! Cheers. I should try these baked tomatoes. I still have some I need to use up. Don't want them going to waste. I am not a tomato lover. However this does look lovely on the table. There is nothing like fresh tomatoes and this recipe looks wonderful - healthy too! I am so bad with growing plants too. Yay you for being able to keep such fresh and juicy tomatoes alive!! What else do you have in your vege garden? I tried planting strawberries, but some little rodent ran off with them all before I got my fence put around it. We'll definitely be trying them again next year though! I have some plants at home but mostly flowers.. Tomatoes look great.. And perhaps easy to grow as well? Would love to try..